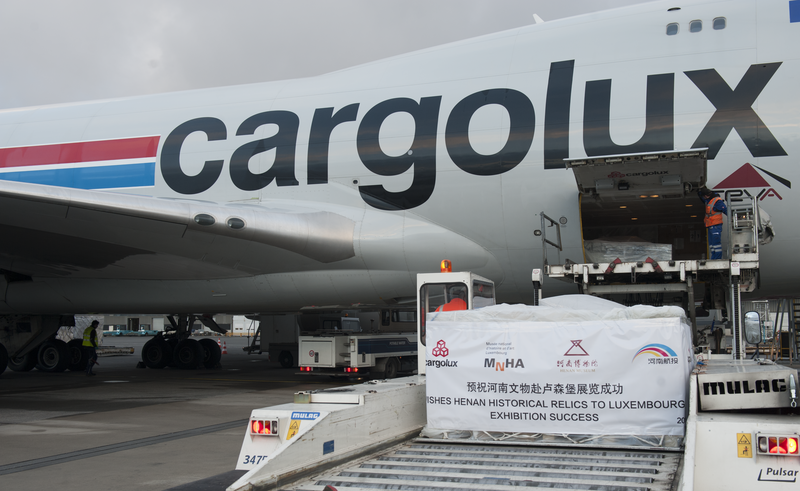 Luxembourg, 08 November 2018 – In the framework of a cultural exchange agreement between China’s Henan Museum and Luxembourg’s Musée National d’Histoire et d’Art (MNHA), Cargolux has transported invaluable historical artefacts between Zhengzhou and Luxembourg. A total of 3 tonnes comprising 145 cultural artefacts were carefully loaded aboard Cargolux’ flight CV975. They arrived early this morning after a 10-hour flight from the carrier’s China hub in Zhengzhou to its home base in Luxembourg. The collection will be displayed at the Musée National d’Histoire et d’Art (MNHA), as part of an exhibition entitled “The Origins of Chinese Civilization: Archeological Treasures from Henan”. These items, that provide an overview of 3000 years of Chinese heritage, include some of the earliest-known examples of Chinese bronze ritual vessels and jade ornaments dating back to the Xia and Shang Dynasties. “Cargolux is honoured to have been entrusted with such an important and invaluable shipment. Our expert teams, who are well-versed in the transportation of sensitive and precious cargo, have meticulously prepared this move to ensure a smooth transport process”, said Richard Forson, Cargolux President and Chief Executive Officer. The airline has indeed a long history in the shipment of priceless cultural items and sensitive artwork. Cargolux boasts a number of partnerships with cultural institutions and museums. “We are proud of our expertise in handling delicate commodities and we look forward to continuing our work in support of culture and the arts”, Mr. Forson added. Transporting fragile artwork and ancient artefacts in particular requires special attention, often involving months of careful planning and coordination. A successful endeavour requires not only the use of customized packaging but also extra careful handling, both on the ground as well as in the air. This ambitious initiative is set to be repeated next year when the exhibition is returned to China after its European stint.